Two things changed my life this week. What is Levain Bakery, you ask? Levain Bakery is a bakery in New York City that is known for their cookies. I had it on my list of bakeries to stop at, and lo and behold, it was a few blocks from the Museum of Natural History. I dragged my family there (it was really hot out and I think I made a few people grumpy). When we arrived at the bakery, it was in the basement of an apartment building but I had faith in the interwebs. Besides, hole in the walls are always the best places. Were they worth the hype? YES. The cookies were thick, doughy, out-of-this-world, fantastic and most of all, maddeningly perfect. They were so thick and large, they looked scone-like in their appearance. My mission? To make a chocolate chip cookie that was my own, but satisfied my chocolate chip cookie sweet tooth the same way that Levain’s did. Levain’s inspired my first ever Every Thirty Days Experiment post, mostly because I wanted to mess around with a chocolate chip cookie recipe and how different flours affect the final outcome of a cookie. 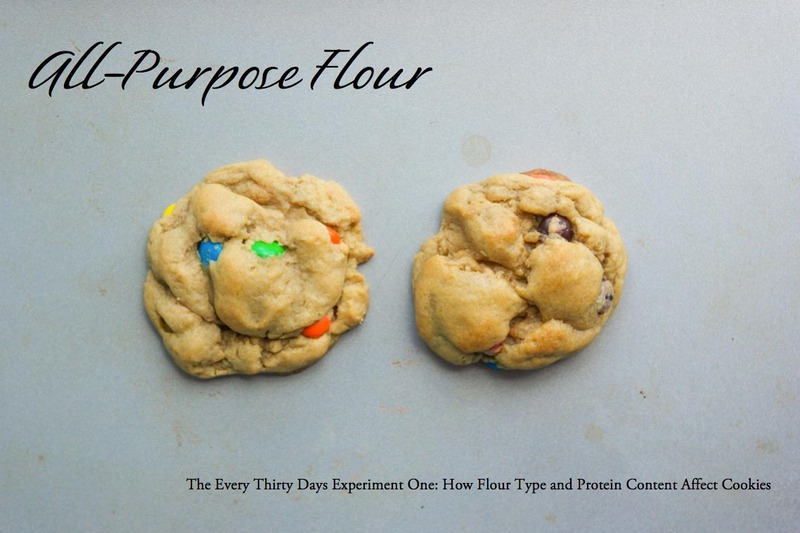 This experiment is also part of my search for the “perfect” chocolate chip cookie recipe. As I’ve said before, every person’s idea of a perfect this or that is always their opinion. My idea of a “perfect” chocolate chip cookie is Levain Bakery’s, but since I don’t have access to that cookie and I am a baker, I need to come up with my own recipe. What is my idea of the ultimate, perfect chocolate chip cookie? The ultimate chocolate chip cookie for me is a thick, caramel-y, chewy cookie that is crunchy on the edges and thick and doughy in the middle. Impossible?! I think not. The second life changing thing? A Silpat mat. 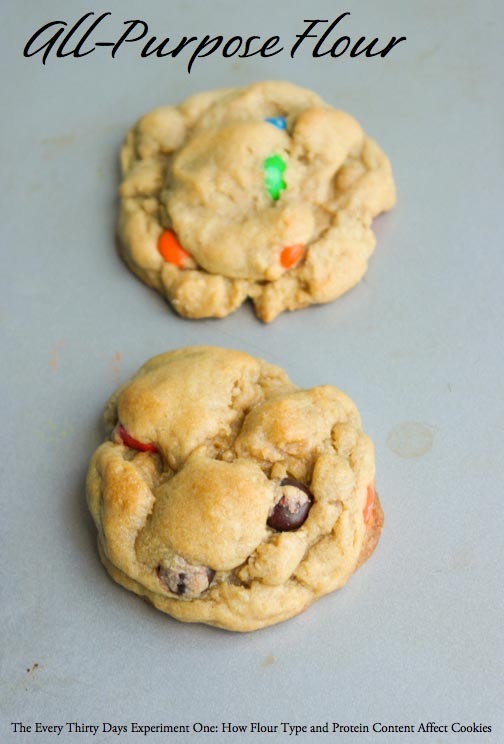 I requested one for my birthday and I used it to make these cookies! I ain’t never going back. Adios parchment paper, adios cookies sticking to semi-non-stick/but-not-really pans! 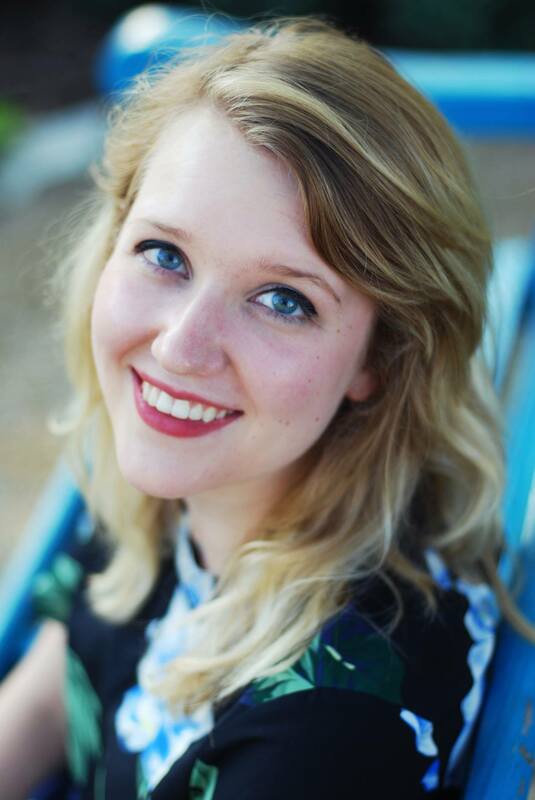 And now, a drum roll please, for my first ever Every Thirty Days Experiment post! 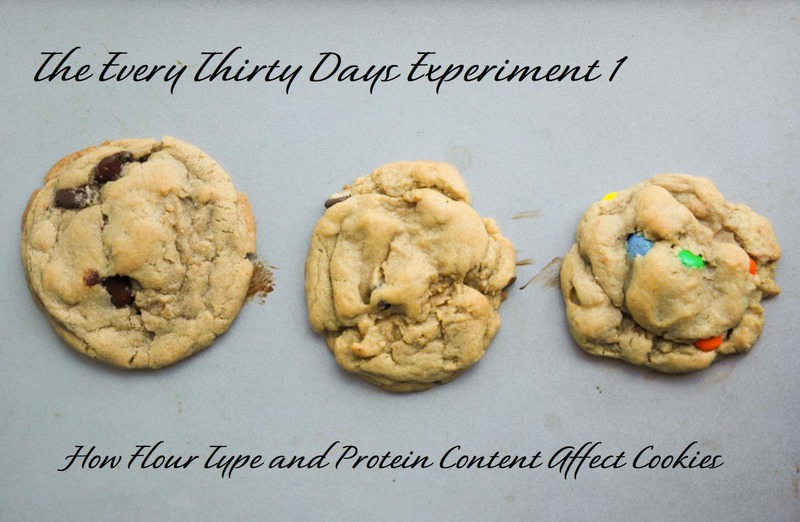 The Question: How do different flours with varying levels of protein content affect the final cookie? How does it affect chewiness and flavor? Most of all, which cookie do I prefer? 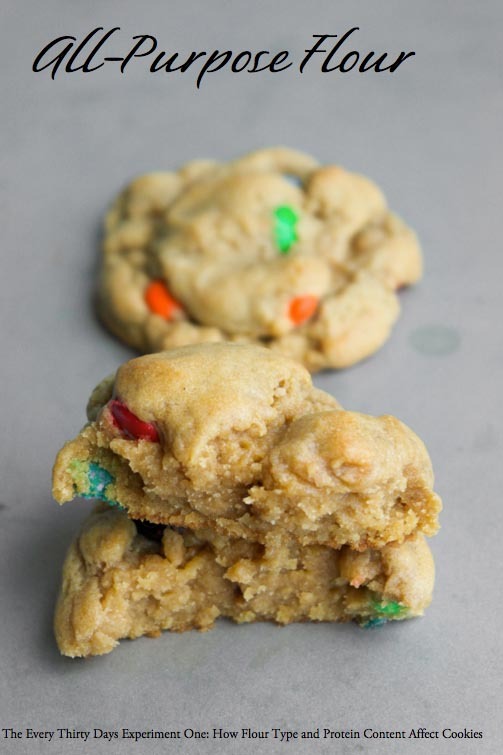 Which cookie best achieves that caramely, thick, crispy on the edges but doughy and soft in the middle, cookie? The Experiment: I made three different batches of chocolate chip cookies. The first batch I made with all bread flour. The second batch I made with half all-purpose, half cake flour and two teaspoons of cornstarch. The third and final batch I made with all-purpose flour. The Science: Bread flour is typically used to, as its name describes, bake breads. Why? Because it has a higher protein content of about 14-16%. Higher protein content is desirable in bread making because when you add any liquid to wheat flour and knead it, it forms gluten networks. In bread, the more gluten networks you have, the greater the air bubbles are in the bread. However, you do not want to form gluten networks in cakes and cookies. So why then would bread flour be used in cookies? Because the higher protein content in bread flour allows for a chewier cookie. However, we still don’t want gluten networks to form. Bread flour just adds extra chew because of the higher protein content. How do we prevent gluten networks from forming? Sugar acts as a gluten scissors. When you have high amounts of sugar, it essentially cuts through the gluten networks. Additionally, fat (aka the ample amount of butter in this cookie recipe) also prevents gluten network formation. The Results: This cookie was supremely chewy. The edges were crispy and chewy and the inside was dough and soft. It was the perfect combo of chewy and melt-in-your-mouth. While I had to chew the edges, the insides of the cookie just sort of melted. Delicious. I actually couldn’t stop eating these cookies. Preheat the oven to 350 degrees. Line a cookie sheet with parchment paper or a Silpat mat. In a bowl, using a stand mixer or a hand mixer, cream together the butter and the sugars. Add the egg, but only mix until just incorporated. It shouldn’t look fully mixed in. In a separate bowl, mix together the bread flour, baking soda and salt. I highly recommend that you use a kitchen scale to measure out the 9 ounces of bread flour. Slowly add the flour mixture to the egg/sugar mixture. It will be a very dry mixture, so mix as much as you can. I finished mixing with my hands. Don’t worry! It should be dry. Mix only until incorporated, then gently fold in the chocolate chips. Bake for 12-14 minutes, or until the top is lightly browned. The Science: Cake flour, unlike bread flour, has a very low protein content ranging from 7-8%. As its name implies, it is is used primarily in cakes because the low protein content prevents gluten networks from forming. In a cookie, cake flour would make a melt-in-your-mouth type feel: tender and moist, almost delicate. However, I didn’t use all cake flour. Cake flour, especially Swan’s Down (which is what I use) has a very distinctive smell and taste. To offset that, I used half all-purpose flour and added two teaspoons of cornstarch. Cornstarch acts as a softener and chewier-izer. The Results: This cookie was a bit of a conundrum to me. It tasted delicious. It fell apart in your mouth when you ate it and almost melted. However, it didn’t feel like a chocolate chip cookie. The chocolate chip cookie experience is chewy and then moist, but there was very little chew factor. I liked it, but my thought that a sugar cookie would be best made with cake flour. In a bowl, cream together the butter and the sugars. In a separate bowl, mix together the flours, baking soda, cornstarch and salt. I highly recommend that you use a kitchen scale to measure out the all-purpose and cake flours by weight. Slowly add the flour mixture to the egg/sugar mixture. The Science: All-purpose flour has a protein content between bread flour and cake flour at about 10-12%. 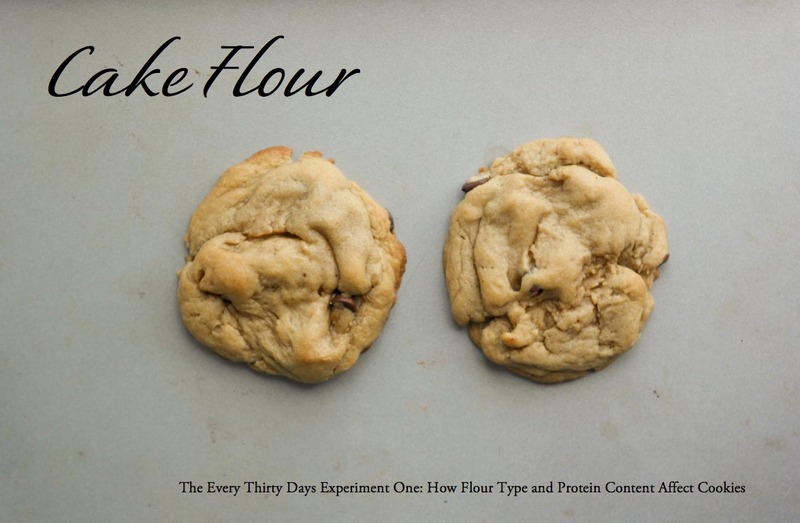 You can make cakes or cookies with all-purpose flour and you can even makes breads. Your cakes won’t be as soft, your bread won’t be as hole-y, but you can still make delicious baked goods. I used all-purpose flour because I wanted to see how it stood up to cake flour and bread flour cookies. The Results: The all-purpose flour cookie was quite delicious. It wasn’t as chewy as the bread flour and it didn’t fall apart like the cake flour, but it still was quite good. In a separate bowl, mix together the all-purpose flour, baking soda and salt. I highly recommend that you use a kitchen scale to measure out the 9 ounces of all-purpose flour. I preferred the bread flour cookie by far. The edges were chewy and crisp, but the insides were soft and melt-in-your-mouth. The cake flour didn’t give me the “chocolate chip cookie” experience. It was too soft; but I think it would be an excellent decision to make sugar cookies with cake flour. The all-purpose cookie wasn’t as chewy as the bread flour cookie. In fact, it was a little bland compared to the magical chewiness and overall experience that I got from the bread flour cookie. 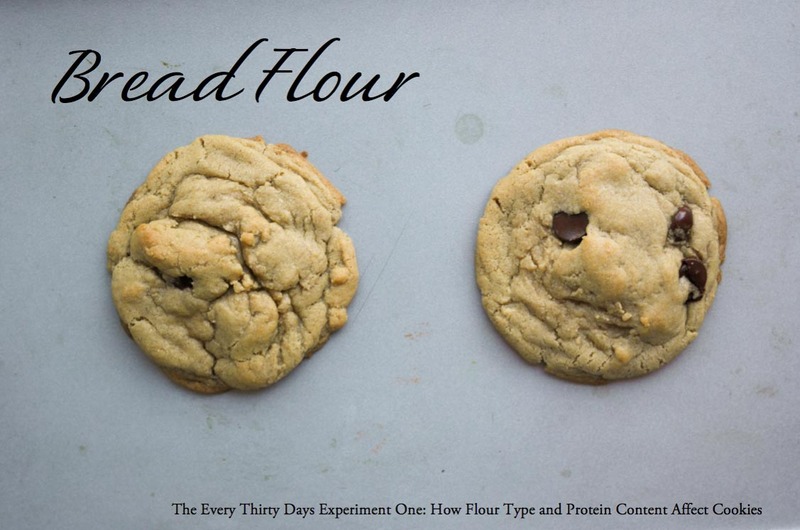 If you’d like to make an excellent cookie, make a cookie with bread flour. That being said, if you only have all-purpose flour, you are one hundred percent welcome to make the same cookie with all-purpose flour. It won’t be as chewy, but I don’t think the difference is so huge that you’ll be experiencing a whole different cookie. As for me, I know now that I will always try to keep some bread flour on hand to make these chocolate chip cookies!